The Hexagon House Bed and Breakfast is one of Pentwater Michigan's premiere historic inns just 15 minutes south of Ludington. Silver Lake and the sand dunes of Lake Michigan are just minutes away. It is your perfect romantic destination. Whether enjoying a quiet moment by the fireplace in our Victorian parlor or sharing wine under the stars on our spacious porches, the Hexagon House B & B hospitality and ambiance will compliment your plans for romance. Shop Pentwater's village galleries, antique shops and the Durand Wine Company. If the mood strikes you, let us arrange a round of golf, beach picnic or sunset cruise on beautiful Lake Michigan. 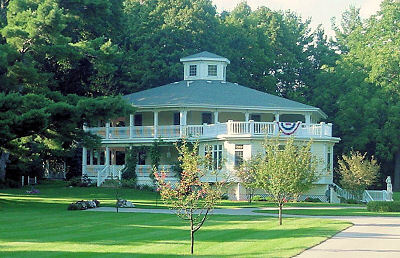 The Hexagon House Bed & Breakfast of Pentwater Michigan is your ideal destination. "Experience the Shape of Serenity."